Welcome to the online showroom of Jewels of the Kimberley, where you will find an exceptional collection of diamond and pearl jewellery lovingly designed and crafted within our established studio in Broome, Western Australia. We specialise in contemporary settings for locally sourced diamonds, pearls and Australian precious stones; Australian jewellery designs that will look effortlessly elegant now and for future generations. Since first opening the doors in 2005, our head designer and creative director Jodi Penfold has utilised her world-class training and natural eye for detail to create distinctive designs for customers hailing from every corner of the globe. Our skilled team now offers a special selection of our stunning diamond and pearl jewellery online, so you can find an exceptional piece no matter where you are in the world. The Kimberley region also produces the world-renowned Argyle pink diamond. Revered and romantic, pink diamonds are breathtaking whether set next to sparkling white diamonds, luminous pearls or a simple gold band. We specialise in distinctive yet timeless jewellery designs incorporating pink diamonds, as well as mesmerising blue, yellow and champagne diamonds. Our diamond jewellery designs are inspired by and reflect the rugged landscapes, natural colours and raw beauty of the Australian outback. WHY INVEST IN PINK DIAMONDS? High quality pink diamonds are only mined in the Kimberley region of Western Australia at the Argyle Diamond Mine. This mine represents 90% of the world’s pink diamonds, with no other mine having ever unearthed such high intense colour to date. The mine site has been scheduled to close down in 2021 as the supply has reached exhaustion. The investment opportunity is expected to continue to be the most discreet, transferable hard asset opportunity of all other investments. The average investment growth of all Argyle pink diamonds is around 15%, reaching up to 20% plus in some cases. 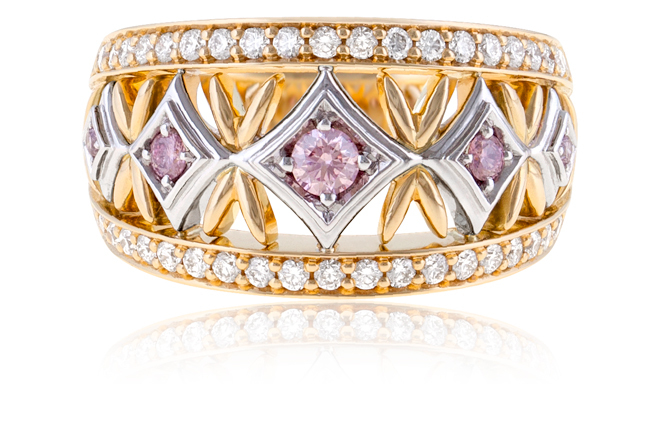 It’s important to note that due to the rarity and high value of these pink diamonds, prices generally increase monthly. Over the last 15 years, prices have never dropped and the specialists don’t believe they ever will. 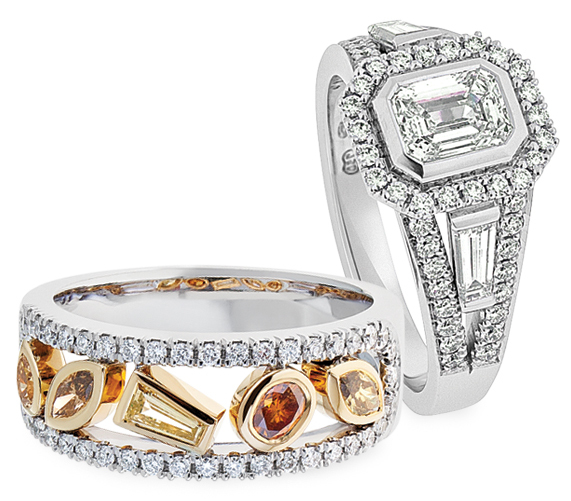 Jewels of the Kimberley can assist you in making a professional choice at all levels of wealth. With our intimate relationship and knowledge of some of the world’s most highly treasure diamonds, we can expertly advise you on certain shapes and sizes to ensure a positive investment will be reached. Jewels of the Kimberley can also assist you with re-selling your investment for the best possible price when the time comes to sell your asset. The extraordinary Kimberley region, one of the most unique in the world, is fittingly home to some of the planet’s rarest and most magnificent gems. South Sea pearls from Broome grow to the largest size known to man, and exhibit a lustre that is highly desirable. It is for this reason we showcase Broome pearls in jewellery designs that will enhance their unique characteristics. It takes local knowledge, careful consideration and a sophisticated aesthetic to allow each pearl to truly shine. This is what makes our Australian pearl jewellery so distinctive, and is the reason we exhibit our pearl jewellery in Perth and across Australia. Jewels of the Kimberley offers the best Broome pearls online and at our studio. Our pearls are carefully hand-selected according to the five virtues, and each comes with a certificate authenticating its colour, lustre and origin. Whether you are purchasing our Broome pearls online or in our studio, you can be sure that you are receiving pearls of a premium quality. Jewels of the Kimberley designs diamond and Broome pearl jewellery that complements the unique personality and style of the person wearing it. If you are looking for something truly one-of-a-kind, we can set your own diamonds and Broome pearls into jewellery with a custom design, or you can choose the perfect gemstones from our hand selected stock to create your dream piece. It doesn’t matter if you are looking to buy diamond and pearl jewellery from Perth or elsewhere across the country. There is simply no better place to purchase diamond and pearl jewellery in Australia. We invite you to explore our collection of diamond and pearl jewellery online, or call or visit our studio to discuss a custom design with our experienced team.